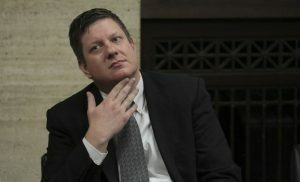 Jason Van Dyke is the first Chicago police officer in half a century to be found guilty of murder for an on-duty shooting, the October 2014 killing of Laquan McDonald. CHICAGO — Minutes after being convicted of murder, Chicago police officer Jason Van Dyke rose in the packed Cook County courtroom to be taken into custody. He had already said his goodbyes to his wife and family. Jurors told reporters most of them thought Van Dyke guilty when they entered deliberations but were initially split over whether to convict him on first- or second-degree murder. In the end, after deliberating for about 7½ hours, they settled on second-degree murder, finding that Van Dyke was frightened when he fired his gun but that his fear was unreasonable. Around the city, a smattering of protesters gathered in public places to watch the verdict unfold. On the CTA Blue Line, riders packed cars heading from downtown while livestreaming the verdict on their cell phones for everyone to hear. 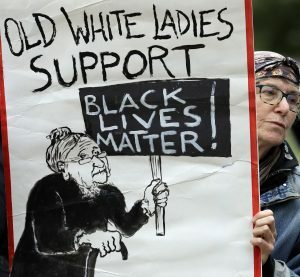 A protester holds a sign in front of the George N. Leighton Criminal Courthouse in Chicago on Friday. Gaughan ordered Van Dyke’s bail revoked at the request of special prosecutor Joseph McMahon, who noted the officer faced the minimum of six years in prison. Gaughan will likely set a sentencing date for Van Dyke when he returns to court on Oct. 30. The verdict comes after a landmark, three-week trial that flipped the script of most murder cases at the Leighton Criminal Court Building, with prosecutors questioning the credibility of police officers who typically serve as their most trusted witnesses. Five of Van Dyke’s fellow Chicago police officers testified for the prosecution, including Joseph Walsh, his partner that night who was granted immunity from prosecution while awaiting trial on separate criminal charges alleging he helped cover up details of the killing to make it appear justified. Chicago Tribune’s Tony Briscoe contributed to this story.